Located in Ilford, Essex, Loaded Burgers is the first restaurant on our list. As its name indicates, their burgers are loaded. They have a great array of tantalizing and creative burgers on their menu, I think these images speak for themselves..
Loaded Burgers provide the option to customize your own burger so if you wanted to you could create something similar to the culinary masterpiece above. One standout burger on their menu is the "Fully Loaded Burger" which includes a range of items so large we couldn't fit them in a sentence, so instead we thought we would just link you the menu here. Loaded Burgers do not serve any alcohol on their menu. The second burger joint is Guanabana, this place isn't actually a "Burger Joint" per say and to call it that would be a discredit. Their menu consists of an array of foods including steaks, fillets, and pasta. 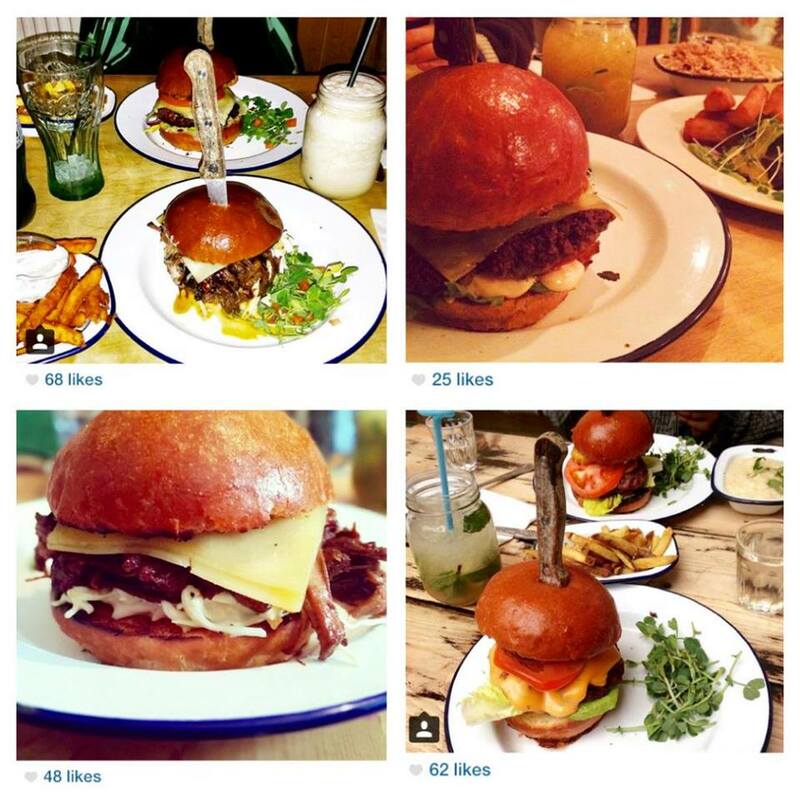 But their burgers have been making so much noise, we had to put them on the list. Guanabana bases it cuisine on Latin American food and so the burgers do have quite a unique appeal to them. Burgers on their menu include "The Big Bajan" which is a char-grilled beef patty, onion rings, and mayo. There's also the barbecue pulled beef burger, or you could go for the "The Jerk" which is a jerk glazed beef patty, hashbrown and mango preserve served between two buns. Their burgers are delicious and have a unique style to them. However, if you're going to go down to Guanabana we would recommend not limiting yourself just to the burgers as their other menu items are just as appetizing. They do not serve pork or alcohol but do have a BYOB (bring your own bottle) Policy. Weekends : 9:30 a.m. – 11:30 p.m.
Burger enthusiasts will have most likely already heard of this place. Amigos opened up their first joint in Acton and due to popular demand they have opened a second joint in Shepherds Bush. They have redone their branding and refreshed their menus with added extras. If their first place is anything to go by then we have to recommend Amigos! Their burgers come in two sizes, 6oz and 10oz and they have a variety of different burger combinations available. You could go for "The Texan" which is sweet corn, relish, nachos and hickory BBQ sauce or for the more basic palette, "The Amigo" a standard but delicious American cheeseburger which includes their special amigo sauce. For more info on their burgers check out their online menu. Amigos do not serve Pork or Alcohol. Opening Hours: Monday - Sunday · 3:00 – 10:00 p.m.
Know of any burger joints that should've made the list? let us know and they could be featured in our next post! Follow Us On Facebook, Twitter and Instagram to keep up to date with the latest.